get insurance for youself and your business. All of the information in the book is up-to-date for the 2018 tax year, including changes brought about by the Tax Cuts and Jobs Act. write legally binding contracts and letter agreements. If you’re tired of doing endless web searches for the information you need to start and run your business, this easy-to-use and authoritative resource is for you. 4. Home Alone or Outside Office? Who Decides Your Work Status? What Happens If the Government Reclassifies You? Before you delve into the following chapters, here's a quick overview of the pros and cons of being self-employed as compared to being an employee. It may help you make an informed decision if you’re thinking about striking out on your own, or help confirm that you made the right decision if you’re already working for yourself. Being self-employed can give you more freedom and privacy than working for an employer. It can also result in substantial tax benefits—benefits that have increased as a result of the new tax law. Most self-employed people bask in the freedom that comes from being in business for themselves and being their own boss. The amount of money you make is directly related to the quantity and quality of your work; unlike most employees, you don't need ask your boss for a raise—you simply go out and find more work. Likewise, if you’re self-employed, you’re normally not dependent upon a single company for your livelihood, so the hiring or firing decisions of any one company won’t have the same impact on you as on that company’s employees. While how much you’re paid is a matter for negotiation between you and your clients you can often earn more when you’re self-employed than as an employee for someone else’s business (especially if your skills are in great demand). Self-employment also provides many tax benefits that aren’t available to employees. Most important, you can take advantage of many tax deductions that are unavailable for employees. When you’re self-employed, you can deduct any necessary expenses related to your business from your taxable income, as long as they are reasonable in amount and ordinarily incurred by businesses of your type. This may include, for example, office expenses (including those for home offices), travel and meal expenses, equipment costs, and insurance payments. In addition, no federal or state taxes are withheld from your paychecks by an employer as they must be for employees. Instead, the self-employed normally pay their own estimated taxes directly to the IRS four times a year. This means you can hold on to your hard-earned money longer. It’s up to you to decide how much estimated tax to pay (although there are penalties if you underpay). The lack of withholding combined with control over estimated tax payments can result in improved cash flow for the self-employed. In contrast to the numerous deductions available to the self-employed, employees are no longer allowed to deduct work-related expenses. The Tax Cuts and Jobs Act eliminated all such deductions by employees for 2018 through 2025. For example, an employee may not deduct work-related driving expenses—but a self-employed person can. The Tax Cuts and Jobs Act also established a brand new pass-through deduction that enables self-employed taxpayers to deduct up to 20% of their net business income from their income taxes, effectively lowering the tax rate on their business income by 20%. This deduction is not available to employees. In addition, the self-employed can establish retirement plans, such as SEP-IRAs and solo 401(k) plans, that have tax advantages. These plans also allow them to shelter a substantial amount of their incomes until they retire. 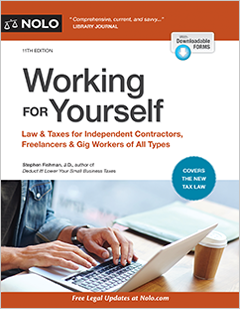 Because of these and other tax benefits described later in this book, the self-employed often ultimately pay less in taxes than employees who earn similar incomes. Indeed, as a result of the changes brought about by the TCJA, the tax advantages of being self-employed are greater than they have ever been. No free benefits. Although not always required by law, employers often provide their employees with health insurance, paid vacations, and paid sick leave. More generous employers may also provide retirement benefits, bonuses, and even employee profit sharing. When you’re self-employed, you get no such benefits—for example, you must pay for your own health insurance. (Fortunately, you can obtain health insurance through Obamacare, even if you have preexisting medical condition.) Time lost due to vacations and illness comes directly out of your bottom line. And you must fund your own retirement. No unemployment insurance. Because hiring firms (companies that hire self-employed people) do not pay unemployment compensation taxes for the self-employed, you cannot collect unemployment benefits when your work for a firm ends. No workers’ compensation. Employers must generally provide workers’ compensation coverage for their employees, which provides benefits for injuries that occur on the job (even if the injury was the employee's own fault). In contrast, hiring firms do not provide workers’ compensation coverage for the self-employed people they hire. If a work-related injury is a self-employed person’s fault, he or she has no recourse against the hiring firm. And even if it’s the hiring firm’s responsibility, the self-employed person will have to deal with the expense and hassle of a lawsuit. No free office space or equipment. Employers normally provide their employees with an office or space in which to work and the equipment they need to do the job. This is not usually the case when a company hires a self-employed person, who must normally provide his or her own workplace and equipment. Few or no labor law protections. A wide array of federal and state laws that protect employees from unfair exploitation by employers (such as wage and hour rules and requirements for family and medical leave) don't typically apply to the self-employed. Complete business responsibility. When you’re self-employed, you won't have a company payroll department to withhold and pay taxes for you. You must run your own business—for example you’ll need to have at least a rudimentary record-keeping system or hire someone to keep your records for you for taxes and other purposes. Others may discriminate. Because you don’t have a guaranteed annual income as employees do, insurers, lenders, and other businesses may refuse to provide you with services or may charge you more than employees for similar services. It can be difficult, for example, for a self-employed person to obtain disability insurance, particularly one who works at home. Also, it may be more difficult to buy a house because lenders are often wary of self-employed borrowers. To prove you can afford a loan, you’ll likely have to provide a prospective lender with copies of your recent tax returns and a profit and loss statement for your business. Unfortunately, the bad aspects of self-employment discussed above do not end the litany of potential woes. Being self-employed can, in some respects, get downright ugly. For many, the ugliest and most unfair thing about being self-employed is that you must pay twice as much Social Security and Medicare taxes as employees. Employees pay a 7.65% tax on their salaries, up to a salary amount capped by the Social Security tax limit ($128,400 in 2018). Employers pay a matching amount. In contrast, self-employed people must pay the entire tax themselves—a 12.4% Social Security tax up to the annual ceiling, and a 2.9% Medicare tax on all their income (more if their income is over $200,000/$250,000, as discussed below); this amounts to a whopping 15.3% tax on their income up to the Social Security ceiling. This is in addition to federal and state income taxes. In practice, the Social Security/Medicare tax comes to less than 15.3% because of certain deductions, but it still takes a big bite out of what you earn from self-employment. As mentioned above, self-employed people must pay Medicare tax on their net self-employment income over the Social Security ceiling. This is a 2.9% tax on income from $128,400 to $200,000 in net self-employment income for singles and $128,400 to $250,000 for married couples filing jointly. High earners will owe a 3.8% tax on all net self-employment income that exceeds these amounts. Employees are not liable for the debts incurred by their employers. An employee may lose his or her job if the employer’s business fails but will owe nothing to the employer’s creditors. This is not necessarily the case when you’re self-employed. If you’re a sole proprietor or partner in a partnership, you are personally liable for your business debts. You could lose much of what you own if your business fails. However, there are ways to decrease your personal exposure, such as obtaining insurance, as discussed in a later chapter. Ugliest of all, you could do lots of business and still fail to earn a living. It can be difficult to get clients to pay you on time or at all. When you’re self-employed, you bear the risk of loss from deadbeat clients. The government is not going to help you collect on your clients’ unpaid bills. Clients who pay late or don’t pay at all have driven some self-employed people back to the ranks of the wage slaves. However, there are many strategies you can use to help alleviate payment problems as discussed in later chapters. Despite the challenges, millions of people are happily self-employed today. Indeed, most successfully self-employed individuals would never go back to wage slavery. The purpose of this book is to help you achieve all the financial and personal benefits of working for yourself. We’ll show you how to make what’s good about self-employment even better, make the bad aspects less daunting, and—hopefully—make the ugly aspects a little more attractive. Spending a few hours now to learn the legal, tax, and practical nuts and bolts of self-employment will save you countless headaches—not to mention substantial time and money—later on. Don’t worry! The mere fact that you’ve chosen to take the time and trouble to read this book shows that you have what it takes to be successful working for yourself.